Happy Malaysia Day to all citizens of Malaysia. Today (16 September 2012) is a celebration that marks the formation of the Malaysian federation on 16-09-1963, whereby Malaya, North Borneo (renamed Sabah), Sarawak, and Singapore joined together to form Malaysia. Cultural dances by Sabah's multi-ethnic groups during the August 31 merdeka celebration a couple of weeks ago. Photo: Victor Lo/InsightSabah. 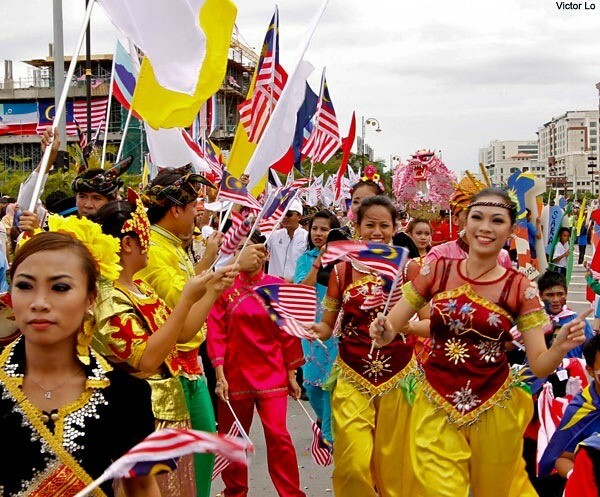 During this year's Malaysia Day celebration, Prime Minister Najib Tun Razak called for a stop to debate over Merdeka Day and Malaysia Day, saying both the dates were meaningful and important in the country’s history. Quite rightly so, and it should be taken in good faith. This year's celebration was in Bintulu, Sarawak. Wow, I had no idea that Malaysia was formed of separate nations like this. I don't know nearly enough history of that part of the world! I hope one day I'll get to visit. Yeah, I'm a Malaysian Boy after all.. :p.. ha ha ha..